Scott and I wanted to take a minute to share with you our thoughts of the different wineries we visited (yes Scott is guest posting!!). He will be posting a similar post on his blog too. You can click HERE to check out his blog called SWELLER. We know that this post will probably not be too appealing for many of you but we hope it will help someone, someday down the road. Asking for advice and reading others thoughts about the different wineries before we left was very helpful when making our decisions between the HUNDREDS of options available. 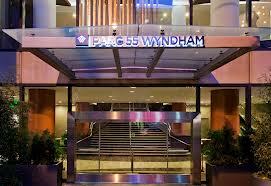 At the end we will review our accommodations (a little bonus feature), so here we go….. The second night we stayed at the Bodega Bay Lodge in Bodega Bay, so when picking our wineries in Sonoma we took into account the distance from the resort. We picked two wineries that were closer to the coast. If you are planning to stay coastal and not drive too far, these two wineries would be great choices for you! 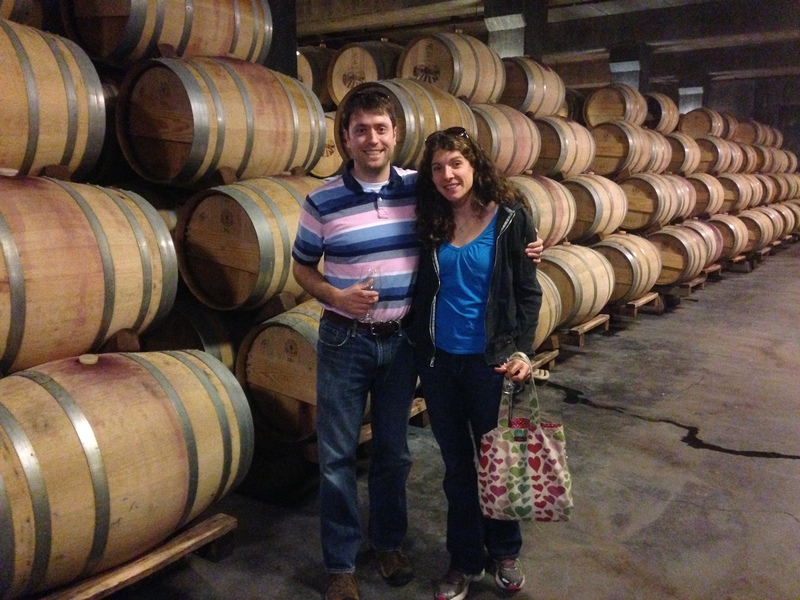 At this point in the trip, we were completely new to the winery experience, Joseph Phelps was a great place to start. It was the middle of the afternoon during the off season and we had the place to ourselves. The staff was wonderful and they really took the time to explain the region to us, what we should see and where we should taste. It was a fun experience and the wine was excellent. Jessica even received a little bonus tasting because she mentioned how much she LOVES Cabernet Sauvignon. They even made a great recommendation on the next winery that we should visit that day. It was the perfect way to start off our trip. It was later in the day and we were not sure if we were going to make it to this winery before their closing time. We had received Wild Horse as a suggestion from the wonderful people at Joseph Phelps. 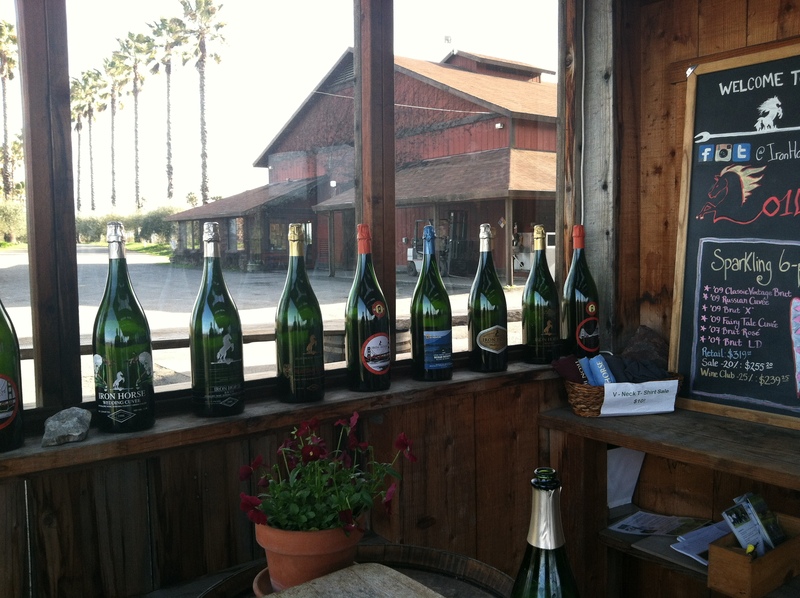 Wild Horse is known for their excellent “bubbly” or sparking wines. This day, they were also known for a 3 foot torrent of water washing over their long and majestic driveway. It had been raining for a few weeks before we arrived and what was usually a dry stream appeared to us as impassable. A gentleman in a 4×4 guided the way for us and we traversed the “rapids” in our tender Toyota Corolla rental. The remainder of the driveway was a one-way dirt road that winded itself up a very large hill. We were then delighted that we mustered the courage — laid out before us was a spectacular, awe inspiring view. Rolling vineyards, beautiful farm houses and mysterious valleys. At Wild Horse, they have a wonderful outdoor tasting room. As the sun started setting, we sipped wine and enjoyed great stories about the vineyard, its history and more information about the local area. We even learned that this vineyard may be responsible for ending the cold war. 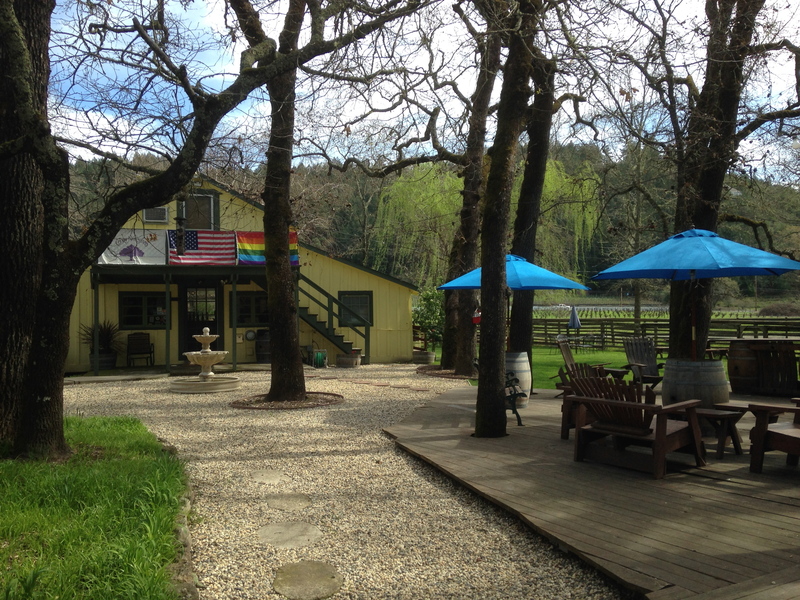 We first read about Frog’s Leap on this awesome Napa website. After visiting Frog’s Leap’s website, I knew this was a vineyard I wanted to tour. They are only open for tastings and tours M-F, so you have to plan carefully. We signed up for the first tour on Friday (10:30) and really enjoyed our time there. This was by far one of our favorite experiences on the trip. The tour was informative and our guide was friendly and made us feel at home on the farm. This vineyard is one of the few that is dry farmed (no irrigation system) and they work hard to be a sustainable and organic operation. Their wines are not certified organic because they add sulfites as a preservative but the farm is organic. We would 100% recommend this winery to anyone who is looking for great tasting wines and an experience that is laid back, fun and not at all pretentious. Their wines are wonderful and we look forward to buying more from them in the future. 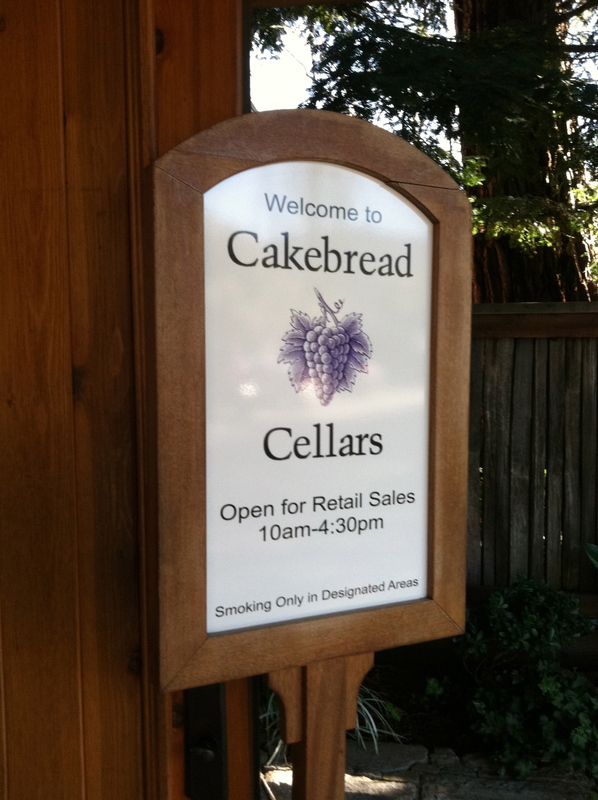 Cakebread had been recommended by a friend who had said it was her favorite winery in Napa. The wines were good (great cabernet) and the people were both friendly and knowledgable about the wines and region. Despite this fact, I wouldn’t rate our overall experience very high. Our tasting at Cakebread felt much less personal than the other wineries and quiet honestly we felt like a number. Our wine educator left us half way through and then another educator took her place. It is still unclear as to why this happened but it definitely effected the flow of our tasting. We wonder if we might have had a better experience if we had done the tour, but you can only pick so many wineries to tour. The bottom line is we enjoyed the wines but wish we hadn’t have spent the $70 on the tasting experience ($35 pp). Francis Ford Coppola? A landscape steeped in rich history? Tasting Wine in a Cave? While some people might think a winery owned by a famous Hollywood director might be littered with Godfather paraphernalia and props for the hit movie Dracula, Inglenook was nothing of the sort. Immediately upon entering the grounds, we could feel the deep historical significance of this property as well as Francis Ford Coppola’s love for art, music, history, wine and family. We did the tour of the ground and were educated to the history behind the estate. 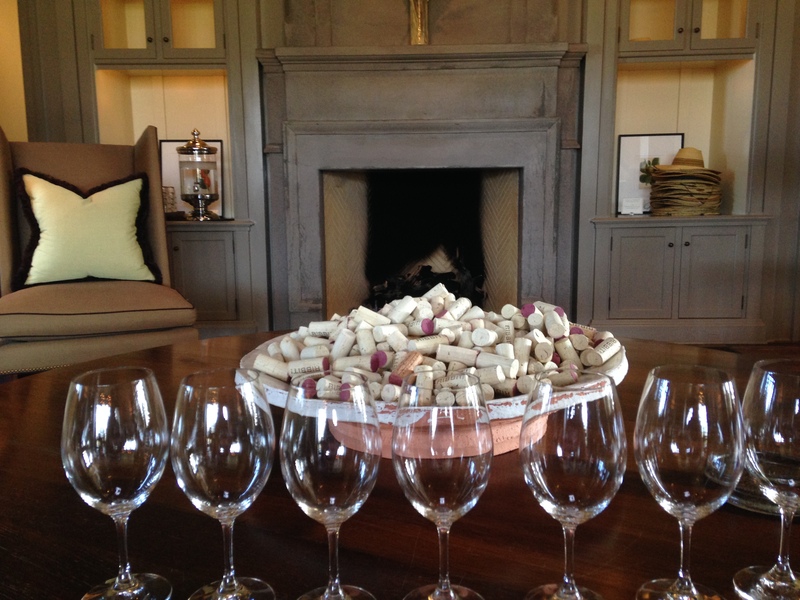 We toured the estate and the grounds and finished the tour with a tasting paired with cheeses in the “Reserve” room. By far, the wines here were the best I tasted the entire trip. Specifically the Rubicon was a winner — rich in flavor and the focus on quality wine making was front and center. Oh the debate between Stags Leap Wine Cellars and Stags Leap Winery is enough to make your head explode. Both are located in the Stags Leap area (hence their names) and half of the people you talk to like one and half like the other. 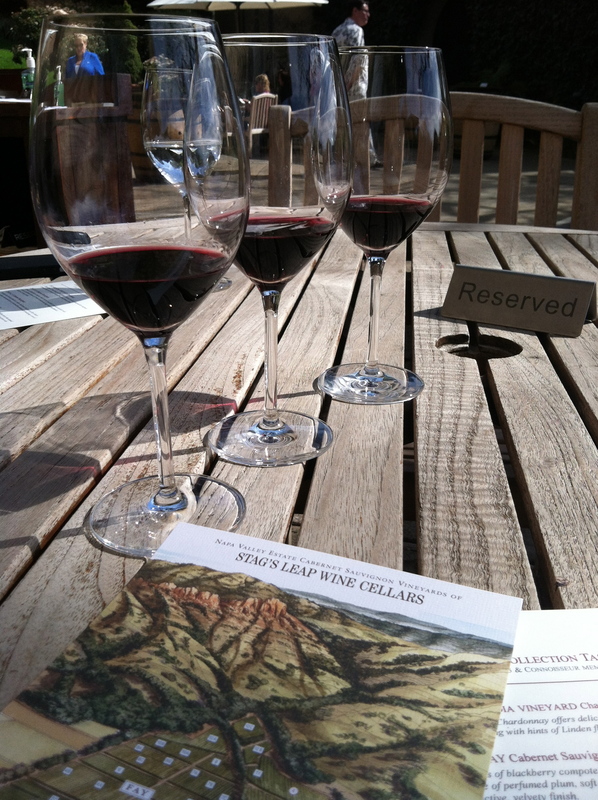 We decided on Stags Leap Wine Cellar because the more laid back folks we talked to preferred it. The outdoor seated tasting experience was a relaxing way to start the day. Gary our wine educator was great about balancing the groups he was helping and gave us all so much of his time and expertise. We never felt rushed and it was so nice to look out at the vineyards while sipping this great wine. They are building a new tasting room that will be even more spectacular, we will definitely have to go back to check that out! The cabernet we tried (5 different types and vintages) was excellent and we ended up with 3 bottles of it! Our trip to Stags Leap Wine Cellars has inspired Scott to build his own basement “wine cellar”. 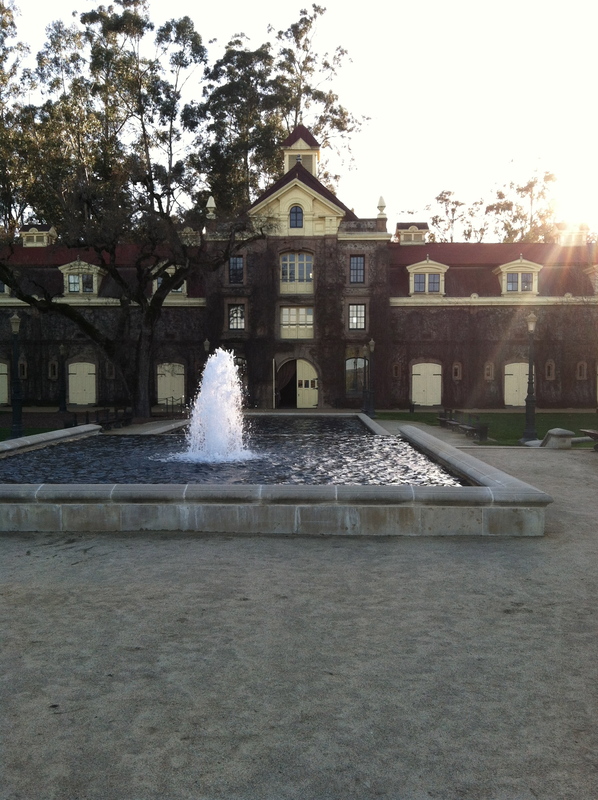 This was definitely one of our favorite wineries and will be yours too if you love cabernet! Scott asked our waitress on Friday night, “What is the most hippy vineyard in Napa?” The answer was Casa Nuestra because they had goats. We were skeptical about this vineyard at first but soooooo glad we made the beautiful drive up the Silverado trail to go and visit. The tasting is one of the cheapest in Napa ($10 pp) and featured 5 of their delicious wines (I think we ended up trying 7 wines). They are a certified organic operation, run their buildings on solar power and have 10 full-time employees. The tasting room is bright and open and features lots of Elvis memorabilia. An Elvis movie was actually filmed on the property and there is a picture of him during that filming hanging on the wall. The wine was really great and unfortunately the only way you can try it is by going to the vineyard or by ordering online. They do no retail sales and because of this can ship to just about any state!!!! They do give their wine on occasion to the famous French Laundry restaurant when they request it and the Reagan’s even featured their wines at the White House! The two goats will soon be joined by doll sheep to help clear out the cover crop between vines. This visit was fun, laid back and so tasty. We are considering joining their wine club, one of the most reasonable in the valley!! 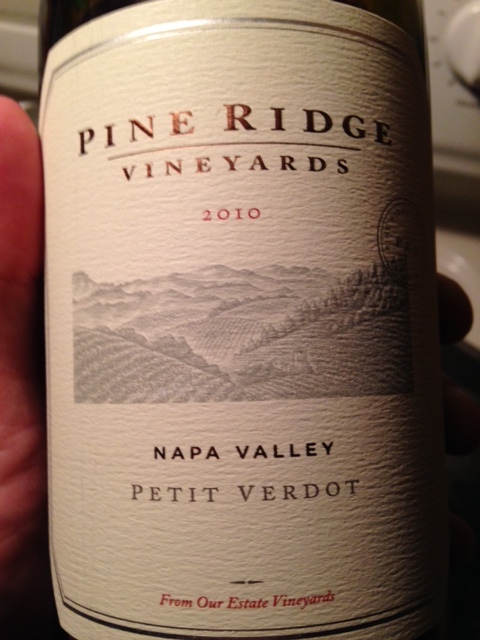 I had purchased a really flavorful Pine Ridge Petit Verdot the week before trip. We thought it only made sense to visit the place from which it came. This was a short stop for us and we had our tasting at the indoor tasting room. The staff was friendly and the wines were very good. Unfortunately they were completely sold out of the 2010 Petit Verdot we enjoyed the week before. We did leave with a nice Cab though. So where did we stay?!?!?! Here is a little about the three places we stayed on our 5 day adventure. This hotel in Union Square was within walking distance to everything. You are about a 15 minute walk to the water and other popular tourist attractions, like the trolley, are even closer. It is a high rise hotel, so the higher you go in the hotel the better your view. The rooms are comfortable and the food and atmosphere at the hotel restaurant/bar was great. This is Scott’s first choice of hotels when in San Francisco and I too really liked it. 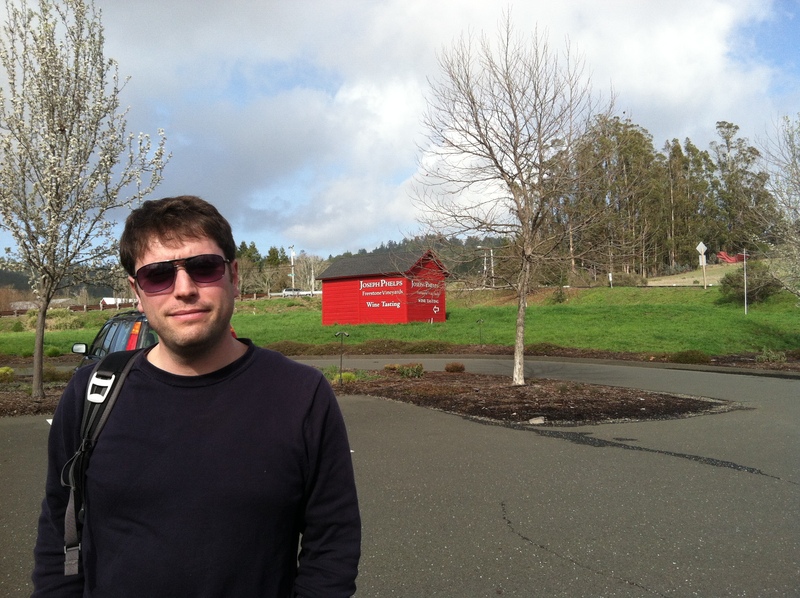 Despite the fact that it was off-season, we really enjoyed our stay at Bodega Bay. Marie at reception went above and beyond to make sure we had a great room. Our room came with a working fireplace and a nice view of the bay and ocean. We enjoyed a nice dinner at their restaurant and also enjoyed the wine tasting in the bar. You cannot beat the setting of Bodega Bay Lodge. The views are spectacular and the staff was super friendly! This is probably the most affordable way to stay in “downtown” Napa during off season. 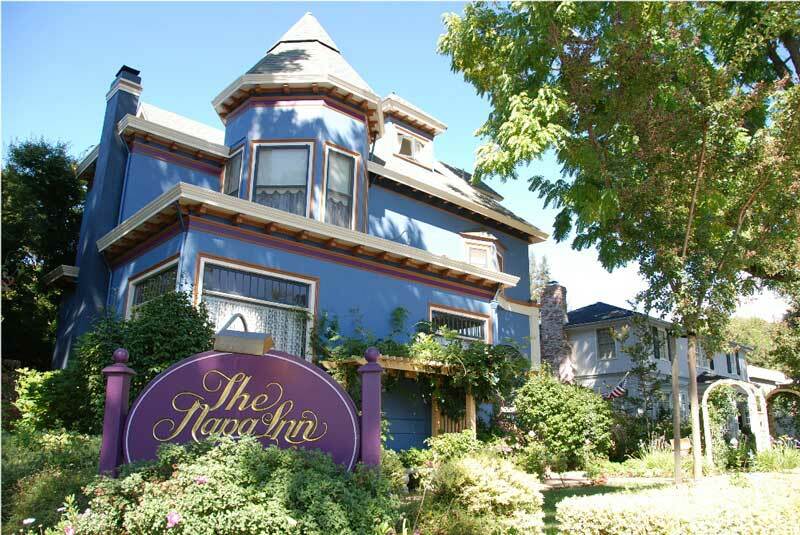 This B & B is only a 10 minute walk to the shops and restaurants downtown but is tucked in a quiet neighborhood which is nice and peaceful. The B & B is made up of two houses and each room comes with its own private bathroom. The staff was super friendly and breakfast was delicious. They were able to accommodate my gluten free diet which was much appreciated. Our room, William’s Hideaway, was featured on an episode of Trading Spaces! They had the episode on DVD in the room and Scott and I actually watched it one night. It was fun to see the transformation. I would definitely stay here again, there was plenty of parking and the grounds are quite peaceful. That is our take on Napa. Our first visit was a success and we can’t wait to go back again.